In Pursuit of My Own Library: Is dieselpunk for me? A weekend spent between my craft room and snuggled on my couch with a good book. Wonderful October! I am always in search of new reading material and Netgalley certainly feeds my reader, but sometimes an author I have gotten to appreciate makes a recommendation. 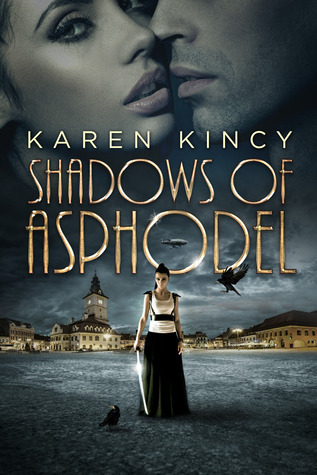 This was the case for Shadows of Asphodel, and it was on Kindle promotion to get to know the series as the second book released. Of course I bit! I will have to rate this book 3 stars. The writing was excellent, but the theme and content were not my niche. I have enjoyed my foray into the steampunk genre, it seemed natural to try a dieselpunk novel next. These authors veer away from a solely steam driven what-if, to a general inventor's paradise where progress wasn't shut down and magic can always be added into the recipe. Kincy introduces mechs on a level with Armored Core to her adaptation of pre-WWI Austria. It borders on my fine line of distaste for alternative fiction. I am all for the what-if game, but there has to be a point where we leave some historical facts sacred. Another deduction in stars comes from this book being in the New Adult category. I am once again having a love-hate relationship with the progress of literature and new genres. New Adult is refreshing with the characters actually being somewhat closer to my own age and life experiences but hard to swallow the gratuitous aspect that seems to be coming from most of the authors. I really do not need to read extensive scenes from the bedroom (Before y'all jump me, I am very aware this is my own personal taste, and certainly will not dampen the story for many readers. This is being honest about the state of the book for those who share my opinion and may want to skip this series). Some of the moments left me glad to step out on my back porch to the cooling October fall air. Whooo. While the actual content may not have please me, the writing, characters, and plot points certainly did. These redeeming factors got a star each to make the book certainly worth the time spent reading. I would probably consider this a rent from the library or bargain sale book. It is not enough of my personal tastes to shell out the full $13 for paperback. However, I am very aware that to many others it definitely is, and I highly recommend those readers put this on their shelf.